We are accepting orders. Get your signed copy today! A Seashell Legacy is a tribute to the ocean and its gifts. Stitched on 32-ct. Rue Green linen by Zweigart Silkweaver Linen, the motifs are created using Gloriana and TheThread Gatherer silks. The four scallop shells are stitched using the Spider stitch and a variegated silk to repllicate the intricate coloring of the scallop shell in nature. The ocean waves round border is stitched in an over-dyed silk using the wave pattern. 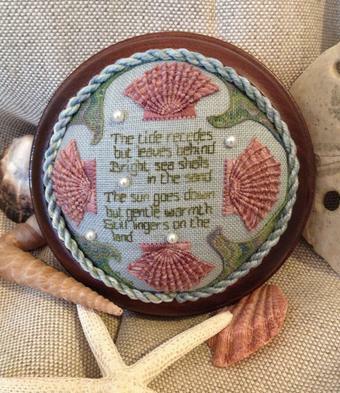 The central verse is stitched in backstitch over one thread using an over-dyed seaweed silk. 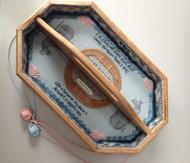 The project is mounted in a 4-inch turned wood pincushion by Sudbury House and embellished with a complimentary hand-twisted cording of silks from The Thread Gatherer. 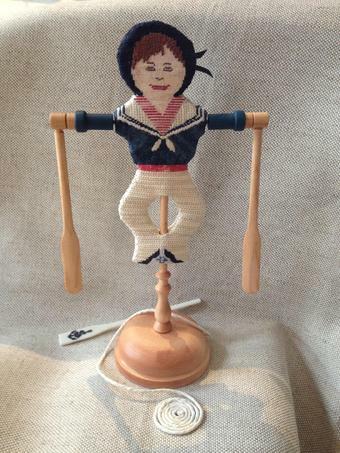 Inspired by a 19th century antique wooden whirligig with articulated arms, this design is created in two panels stitched to replicate the original piece. Stitched on antique white 32-ct. Zweigart linen using over-dyed silk fibers from The Gentle Art and Weeks Dye Works, the sailor's middy shirt and tie with textured trousers are executed in Alternating Cashmere and Continental stitches, Milanese stitch, Plaited Gobelin, Cashmere Checker, Alternating Roumanian stitches and Cross stitch over one. The arms, paddles and stand are meticulously hand turned in new wood and shaped for a professional presentation. The mechanics of the moving parts are very special and will be fully demonstrated in class along with full stitching and finishing instructions. Marcia is very excited to share this unique new project with you! I am proud to provide the needle artist with a website of finishing services, needle art products, seminars, needlework finishing DVD's and exceptional needlework accessories. Since founding the Binding Stitch in 1979, I have had both the opportunity and the pleasure to work with many talented and respected needlework designers and teachers and retailers in developing needlework finishing techniques, products and services of the highest standards. I have also had the privilege of sharing my knowledge and creative conceptualization with needlework students on the national needlework teaching circuits since 1990. Through my experience in the needle art industry, I am always on the lookout for new products and materials that will enhance the needle art experience and the presentation of each project. In 2013, The Binding Stitch will focus on the release of a complete reference book of needlework finishing. In addition, we will be continuing to bring our on-line classes to the market . Look for our email promotion to be part of our online stitching groups. Marcia will continue as a specialty needle art finishing service provider for needlework designers and teachers in the production of models, prototypes and teaching materials; in addition to the professional finishing services provided to the individual needle artist nationwide. 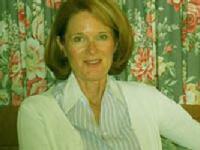 Marcia will also continue to teach and make available her finishing DVD's and books, new-line needlework products and accessories, along with offering specialty stitching seminars. It gives me great pride to grow The Binding Stitch to continue to serve so many aspects of the needlework market, and I personally look forward to sharing my love for professional needlework presentation with you.